A mega-pincushion with storage! Awesome! 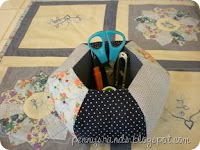 "I love my Hexie Caddy Pincushion ! And there are many of my blog readers and followers who agree too! how to make bias tape without any kind of bias tape maker please .